Sen no Rikyu (1522 – 1591), the grand master of the Wabi (Meaning “Sober and calm refinement”) school, brought the tea ceremony close to the spirit of Zen. 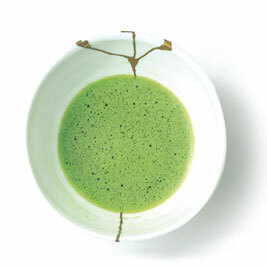 Rikyu considered the spirit of the tea ceremony and that of Zen to be naturally joined (in what he calls “Cha-Zen Ichi-mi”). For him, making tea while engaging the five senses and tasting it meditatively is to have a complete Zen experience. We would be very pleased if you could come to our place and share a moment of joy through your five senses, while finding the spirit of Cha-Zen and Japanese culture through a couple of tea. Jugetsudo Japanese Tea House opened its doors in 2003 in the Tsukiji district of Tokyo, serving delicious green teas in an atmosphere of natural and harmonious Japanese decor. Soon after, Jugetsudo began exporting their authentic products worldwide. With our tea and through various activities, we intend to share a bit of Japanese culture and atmosphere. On Oct. 10, 2008 our first tea house outside of Japan opened in the Saint-Germain-des-Prés district of Paris. Auspiciously, 2008 marked the 150th anniversary of the Franco-Japanese Treaty of Amity and Commerce. By opening our boutique in Paris when we did, it was our intention to modestly associate ourselves with the commemoration of Franco-Japanese relations and contribute in our own fashion to strengthen mutual understanding between our countries.